The Wedge-tailed Shearwater is found on island throughout the tropical Pacific and Indian Ocean, including islands off Japan, the Islas Revillagigedo, the Hawaiian Islands, the Seychelles and off Western Australia. 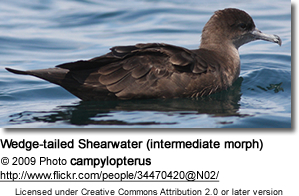 The Wedge-tailed Shearwater was named for its wedge-shaped tail. The legs are flesh-coloredand the bill is dark. Pale: Grey-brown back. The head and upperwings, and the plumage below is whiter. Dark: The plumage is entirely dark grey-brown plumage. The pale morph is most common in the North Pacific, and the dark elsewhere. However, both phases occur in all populations.